In celebration of National Food Safety Education Month in September, NSF International, a not-for-profit, public health and safety organization, is highlighting some of its food safety programs to help raise awareness and support for food safety education throughout the year. 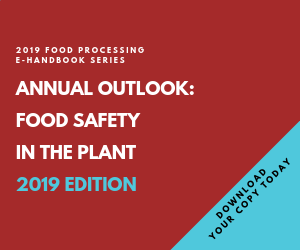 The month-long awareness campaign focuses on the importance of food safety education in the restaurant and foodservice industry. “National Food Safety Education Month is a great way to raise awareness about the importance of food safety practices, not only in our own kitchens, but also in the daily practices of the growers, manufacturers, distributers, foodservice professionals and retailers of our food,” said Kristen Holt, NSF Senior Vice President of Food Safety and Quality programs.